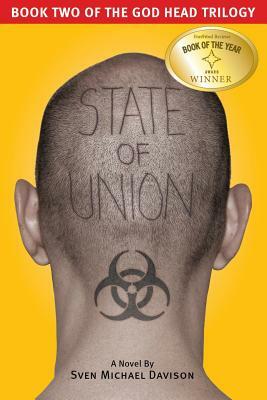 State of Union (the God Head Trilogy), 9780985552855, 406pp. THE ENEMY LIES WITHIN... After living on the fringe of society for five years, Jake Travissi returns to civilization to find that a recent nano-virus epidemic has killed millions worldwide. Implanting a Personal Chip (a device which enhances the mind with the capabilities of a smart phone and personal computer, but creates a window for hackers) into the brain is the only cure. As if this wasn't bad enough, Jake has been asked to kill his former LAPD colleague Joaquin Parks. Parks is now the head of a church accused of nuclear terrorist acts around the world. Meanwhile, the dawn of Artificial Intelligence and the promise of immortality could be just around the corner... With his fianc e Tomoko Sakai and his faithful Husky Lakshmi, Jake is thrown into the center of a conspiracy engineered by an international group of powerful men and women who call themselves The Consortium. The Consortium's goal is to end Free Will and establish absolute control over the world. In his quest to defeat this powerful enemy, Jake finds himself traveling to Antarctica, Los Angeles, Arizona, Beijing, Shanghai, Mumbai, and Acapulco. But time is running out, as all of humanity rapidly approaches large-scale genocide or life as automaton zombies. In 1998, author Sven Michael Davison was like a lot of others of his generation, a young man with a dream, an old car, two suitcases, two hundred dollars in his pocket, and a pretty good-sized student loan. After stints in Colorado, New York, and Beaver Island, Michigan, and having written a screenplay that was produced and a first novel, he moved back to Los Angeles and started working as a temp at Twentieth Century Fox. The rest of the story is hardly ordinary. After a few years, his job came with titles likes "Head of" and "VP of" at Fox, and soon he was fluent in all new technologies relating to information delivery. But there was always something about being a writer that drew him back to the vivid places within his imagination, so at the end of ten years he left the corporate world to return to writing full time just as he was offered a promotion. The God Head Trilogy explores Sven's abiding interest in Popular Science, Ray Kurzweil's Singularity Theory, and many other futuristic themes. He became fascinated with chip implants that could not only track people, but also ultimately control them. It was an opportunity for him to explore themes about the narcissistic nature of society, consumerism, fear politics, and technology gone wrong. Sven has always loved science fiction but has longed to know what happened between today and the distant tomorrow. His God Head Trilogy is a dark exploration of a hauntingly possible near future. To date, Sven's life journey has taken him to all of the seven continents. He is an ordained minister, walked forty feet on his hands on stage during a concert, eaten guinea pig and a whole fish-heads, gills, and all-and spoke like Arnold Schwarzenegger during a Fox press event. Sven lives in Los Angeles with his wife and young son and is decidedly unsure about which parallel universe he inhabits or when he will be able to turn his head 480 degrees.